It's time for our CYH Fall Fundraiser and we've found an easy way for players and families to raise money for Cambridge Youth Hockey. Handcrafted fudge made with natural ingredients - a perfect holdiay gift! 2. 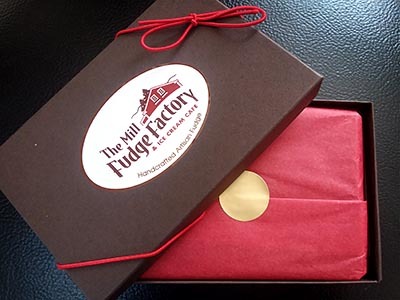 Players then take orders and collect payment for as many of these tasty fudge gift boxes as they can for the next few weeks. NOTE: Fudge is a perfect gift for: teachers, caretakers, home help, grandparents, friends, mail and newspaper carriers, and just about anyone. And yes, that includes coaches! There's a prize: The team that sells the most fudge wins an hour of ice time for a team party in March. -- Monday & Tuesday Nov 13 & 14: Order sheets delivered to CYH teams. -- Tuesday 19th December: Fudge delivered to CYH and will be distributed Wednesday-Friday evenings at rink, or by special request for pick up. See the fudge, and print out a flyer. Print out extra order forms. If you have any questions please ask Kellie at the rink, or email her at KellieDeJon@yahoo.com.